In August 2016, OSIWA disseminated a short documentary film on the harm reduction experience in Senegal and CEPIAD. To help us do this work, OSIWA partnered with Association Culture WAW (formerly known as MobiCINE), an organization that aims to bring back the African cinematic experience in Senegal through the format of pop-up or mobile cinemas. Waves of dialogue in West Africa on drug policy reform with the ultimate goal of decriminalizing drug use and possession for personal use have been making headway. Progress is slowly but surely on its way, and different actors are employing various tools and strategies to reach this goal. Senegal is home to le Centre de Prise en charge Intégrée des Addictions de Dakar (CEPIAD), the only government-run harm reduction facility in West Africa. CEPIAD does remarkable work by providing psychosocial support, needle exchange programs (NSP) and opioid substitution programs (OST) for drug users struggling with addiction, but despite its presence, Senegalese stakeholders working on drug related issues have yet to see any advances in legislative reform. While high level dialogue on reform is necessary, it needs to be complimented with community-level dialogue. After all, you can only begin to build a movement of reform by building community support for the lives of those in communities affected by the issues you are trying to change. In this case, building a movement for reform is not possible if we do not make a concerted effort to make the lived experience of drug users the central focus. In August 2016, OSIWA disseminated a short documentary film on the harm reduction experience in Senegal and CEPIAD. This year, film screenings targeted high policy level officials and both regional and international civil society actors. However, there was a shift in approach following the realization that the film could also be used as a participatory tool to reframe the discourse and expand dialogue in communities around locally contentious themes such as drugs and drug use. 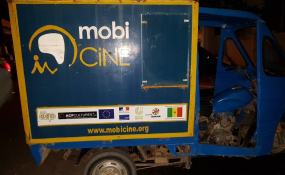 To help us do this work, OSIWA partnered with Association Culture WAW (formerly known as MobiCINE), an organization that aims to bring back the African cinematic experience in Senegal through the format of pop-up or mobile cinemas. They travel to different communities and schools to screen films and documentaries with social messages with the aim of raising awareness and mobilizing communities around a particular issue. Cinema is usually a passive experience, however mobile cinemas bring a participative and interactive element to the viewing experience. The first phase consisted of three open air screenings for the general public over three days from the 8-11 September, 2017. The three targeted neighborhoods in Dakar were Parcelles, Grand Dakar and Medina –'drug hotspots' in the city. Around 8 pm – a busy time in these neighborhoods – the screen was set up and the short film projected in an open air space and any passer bye that was interested could sit or stand and watch. After the film, an outreach worker from CEPIAD facilitated discussions with the viewers. The participants were diverse and they included children, the elderly, drug users, curious shop keepers and pedestrians, all showing some level of interest on the subject matter. For so many, it was a topic that had never been breached before, especially in an open manner. I had initially hoped that by popping up in these hotspots, the film would help redirect drug users watching to the harm reduction center. However, a series of unpredictable events occurred over three days of screening, such as boys and girls gathering around and listening attentively as they hear the firsthand account of a man who had battled addiction share about his experience and warn them about starting. There was also an elderly woman speaking out about her son's experience using drugs and the growing concern of drug use amongst teenagers in the neighborhood. Then there was also a user, who got chastised by other attendees after he felt it was ok to light his joint there and then. For an initial pilot phase, managing this project has allowed me to see and understand the value in the mobile cinema approach, adopted by Association Culture WAW, as more than just entertainment. This approach provided the platform for those who wouldn't ordinarily get to speak up about these issues, to be heard. The stories and experiences of ordinary people, neighbors and family members, who are in some way, indirectly or directly, affected by bad drug policies were shared. Using the mobile cinema approach, we are able to convene people in a unique way, giving us the avenue for which minds are opened. There is substantial change in the perceptions of drug users and substantive community support around the human rights of drug users in Senegal is built. In the second phase of this project, we will use the mobile cinema to screen the film in schools, directly targeting high schoolers. Copyright © 2018 Open Society Initiative for West Africa. All rights reserved. Distributed by AllAfrica Global Media (allAfrica.com). To contact the copyright holder directly for corrections — or for permission to republish or make other authorized use of this material, click here. Africa: West Africa's Democratic Tipping Point? West Africa's Democratic Tipping Point?